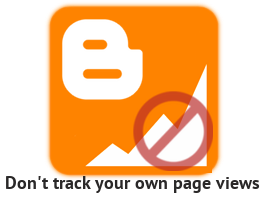 Home » Blogger » Tips » Issue with "Don't track your own pageviews"
Do you use your own domain name with Blogger? Do you place "Blogger's Stats Widget" on your page? Or do you regularly check up the stats from your Blogger's dashboard? 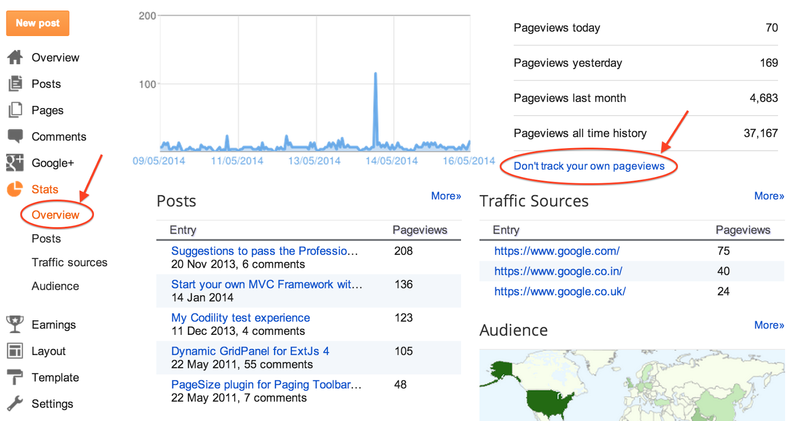 And most importantly have you found that "Don't track your own pagesviews" link no longer works? Well, it used to be working when I used the regular subdomain under blogspot.com. Many bloggers have reported this issue to Google but yet no acceptable answers from them. However there is a way to patch this issue. Let's have a look how to re-produce this error. 5. A while later, an error message "There was an error while fetching stats. Please reload page." prompted. 6. If you reload the page, try again, and the above message will appear again. So, if this is the issue, how can I make my own blogger site stop tracking my computer? 5. Go to your home page and keep reloading the page. You will find that the pageviews counter stop incrementing (the counter is either on your home page or the dashboard). Thanks so much for spelling the steps out so clearly and ACTUALLY fixing my problem. You are welcome. I am glad this article could help you out. Thanks for your feedback. Have you tried to reload your blog and see the result of the counter? It seems working to me? Is this working for the homepage only, or are the post pages not counting too? Thank u very much. It's working for me. But I want to know that whether it will affect my other json scripts in the website or not? As far as I know, it shouldn't affect your json. Thanks for helping us blogophytes fix this annoying problem! Thanks. Before this I was literally subtracting my page counts from the overall estimate. I got a question, How do you create a "Mod" ribbon right next to your name ? You are welcome. What do you mean by "Mod"? I have custom pages not found too. It does not track pages count on my browser even I hit the pages not found page. The concept of this method is to set the cookie on your browser to stop tracking pages counts of your blog with private domain name. It does not fix the issue of Blogger's interface. Your mod ribbon right next to your name, haha I am just curious, I've been trying to implement that concept into my website, But I haven't been able to find a way of doing it. well, you may need to create your own template on Blogger and then you can do pretty much any thing you want on the site. Can you show us your website? thank you. thank you. thank you. ive been on a search for so long and finally found something that FIXED the problem. appreciate you! The counter is still updating whenever I visit. This hack really works. Now Blogger doesn't track my pageviews anymore. Very useful in analyzing incoming traffics other than my own. Thanks very much! That was an easy enough fix - thank you for sharing. The "don't count your own pageviews" option worked on my .blogspot.com blogs, but not my blog with its own domain. This did the trick. One question does analytic counts my visit or not? i dont have my own domain. will this work? Thanks a lot, this seems to have worked! I wondered if you could tell me how to reverse this feature in case I ever need to or want to? It didn't work for me and Google Adsense didn't accept me because of this..
Thats because this URL makes changes in the cookies, and ccleaner deleted all your cookies stored on your computer..
thanks it works! do i have to do this on my phone too? Sorry to bother, but what should I do if the page says error page cannot be found? Hey Elvis, it didnt work for me. I can still see my page-view count increasing. i tried it but the page view is still increasing.. its so annoying :( its in fact increasing as 2 times per opening lol how can i stop that? Unfortunately, It didn't work in my case. Any other ideas?